We haven’t done one of these for a while, so here’s another rerun from my original blog, the Daily Aneurysm—which, I notice, has finally disappeared from the Internet because somebody squatted on the domain name. This one is from December 22, 2005, and it has been edited slightly. As is the case with all of these off-topic posts, you won’t hurt my feelings if you skip it. With the centennial of Armistice Day coming this weekend, here’s something off-topic. The picture was taken 100 years ago. The young man in the military uniform regards the camera with a unsmiling gaze meant to express determination. It is a look I don’t remember seeing. Years hence, he will almost always look at his grandsons with a kindly twinkle. The determination is there because Arthur E. Bartelt of Winslow, Illinois, age 20, is going off to lick the Kaiser. We don’t know how Art came to be in that uniform. As America’s involvement in the Great War intensified, he would have been required to register for the draft in either August or September 1918. This third registration was the first to include men under the age of 21, but it’s likely he had already volunteered by then. I never thought to ask him, and my grandmother, whom he would not meet until the 1920s, wasn’t able to remember. 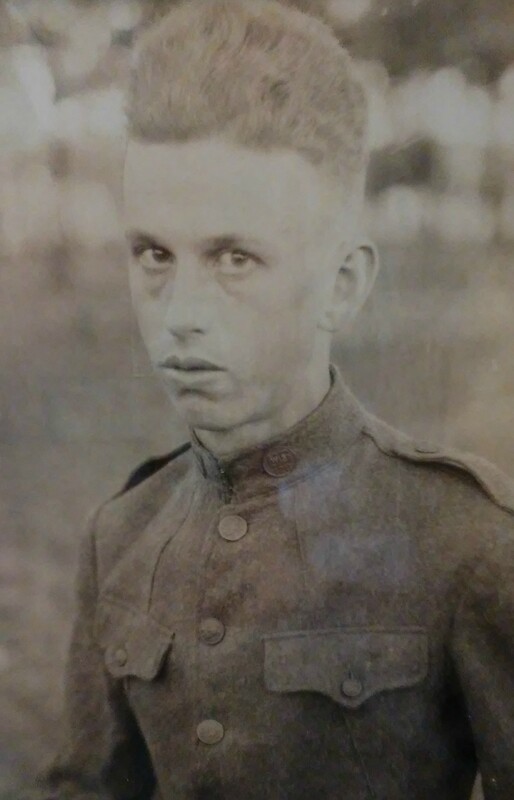 It is likely that he had completed his stateside training and was set to go to Europe when the Armistice intervened, because below his picture in the photo frame hangs a medal that belonged to him, inscribed with the words “welcome home.” So he received his welcome even though he never left. Grandpa Art changed the spelling of his last name from Bartelt to Bartlett sometime in the 1920s. (We don’t know the why of this either. It may have been to reflect the way people in northern Illinois pronounced the name. A better story I’ve also heard is that he changed it to spite his father, my great-grandfather, with whom he didn’t get along.) He has been gone since 1986. I have a million questions I wish I had asked him, and not just about his military service or his father. I suspect that his military records were among those destroyed in a 1973 fire at the National Personnel Records Center in St. Louis. Eighty percent of the Army’s records of personnel who served between 1912 and 1960 were lost. The jacket Art wears in the picture was eventually handed down to my brother, who wore it out during his college days in the early 80s. (I still have the pants, somewhere.) Although I have pictures of Art in a suit, I always think of him in bib overalls, with a chambray work shirt underneath and the engineer-style cap he always wore on his head. The only variations came in the summer, when it was really hot. He would shuck the chambray shirt and work in bibs alone, and he sometimes broke out a safari hat with a wide brim to keep off the sun. One day, two or three years after his health had made it impossible for him to work as he used to, Art decided to get the ladder, climb up the side of his house, and clean the gutters. He had a heart attack, fell off, and died at age 88. Sad, yes, but during the last half-hour of his life he felt useful and was almost certainly happy, and we should all be so fortunate as to go out that way. Grandpa Art and Grandma Vera, so stoop-shouldered she was nearly bent double, lived on the other end of our farm, in a house that my brother and his family occupy now. They were fixtures in our lives. When we were little, we’d see one or the other, or both, almost every day. While they were incredibly kind to my brothers and me, my sense is that they were not nearly so kind to my father, their only son. I wasn’t old enough to understand what went on when it was happening. Now that I’m older, it’s a subject I haven’t pursued. I’d rather remember them the way I do. The following is largely off-topic but plausibly a part of the ongoing Tales of ’73 series. Read it or don’t, your choice. We continue this intermittent series on 1973 with a story very few people know. I’m putting it on Off-Topic Tuesday since it has nothing to do with music, really. OK, I’m back. Quite nearly everything is still terrible, but we have no alternative except to go on.